Don’t worry, parts 2 and 3 of “Oh, Mapleine!” are coming soon. But I found a couple more things that I thought would be of interest, and didn’t want to wait to post them. Last year I posted about the cookbook Mexican Cookery for American Homes (1936 edition), and later tried a recipe from the book for “Enchiladas, Mexican Style” that turned out to be excellent. Yes, you read that correctly. Here you go! Cook onions, celery and green pepper in butter until tender; add hamburger and continue cooking until partially done. Add tomato puree, salt and simmer until meat is tender. Turn into a greased casserole, cover with contents of No. 2 can Gebhardt's Spaghetti and Chili and bake in moderate oven 20 min. Mexican? Probably not so much. But it reminds me of some of the casseroles my mom cooked in the 1970s. One other site I wanted to point you to is La Cocina Historica, a project of the University of Texas at San Antonio Special Collections Department. The blog features recipes from the university’s Mexican Cookbook Collection. They have more than 900 Mexican, Texan, and Southwestern cookbooks in Spanish and English, dating from 1789-2010. The collection includes printed cookbooks and also handwritten manuscripts. The bloggers (multiple people contribute to the site) try out the recipes and describe how they turned out. I think “Huevos al Estilo Español” (1908) sounds lovely, but that’s probably because it’s pretty close to my breakfast burrito recipe already. I’d just mix up that filling and wrap it in tortillas. Imitation flavorings tend to be frowned upon these days, or, at least, not respected very much. No one wants “chocolate-flavored” candy if they can have real chocolate instead. But there is one imitation flavor that is commonly eaten without complaint in the US and Canada — maple. The “maple” syrup that most people have on their pancakes and waffles isn’t made of maple at all. (In the US, if the label calls it “maple syrup,” it’s supposed to be 100% pure maple. But the majority of syrup sold in grocery stores is plain old “pancake syrup,” and that’s the artificial stuff.) It tastes reasonably similar to maple syrup, and it’s fine for what it is, but it’s still an imitation. Most grocery store pancake syrups, as you can see here on the Aunt Jemima website, are corn syrup with added colorings, preservatives, and natural and artificial flavorings. Throughout the 20th century, however, many homemakers made a much simpler artificial maple syrup with only three ingredients: granulated sugar, water, and the flavor extract Mapleine. In the product’s early years, Crescent did not (perhaps) communicate quite as well as they could have that Mapleine was, in fact, not maple at all. For example, the package pictured in the Pacific Monthly ad features a large maple leaf in the design, and does not mention at all on the front that the flavor is not real maple. 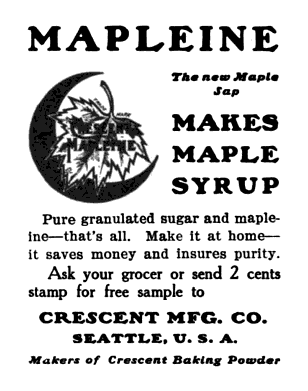 One of the earliest ads for Mapleine, from a 1905 issue of The Pacific Monthly, calls it “The new Maple Sap,” with no mention of its artificial nature. A jury found Crescent guilty of misbranding, after which the company reached an agreement with the government that the name “Mapleine” could continue to be used, as long as all labeling was modified to plainly show that the product was an imitation maple flavor. The modifications were made, and Mapleine stayed on the market. This 1908 ad, published during the same month in which those 300 cases of Mapleine were seized in Chicago on the charge of misbranding, shows that Crescent was already taking pains to clearly label the bottles and ads. 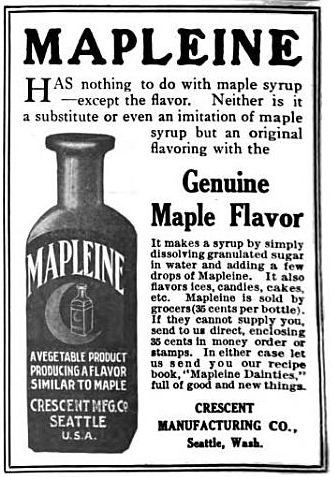 The ad leads with the not particularly enticing paragraph “Mapleine has nothing to do with maple syrup—except the flavor. Neither is it a substitute or even an imitation of maple syrup but an original flavoring with the Genuine Maple Flavor.” The bottle pictured now contains a clear disclaimer. 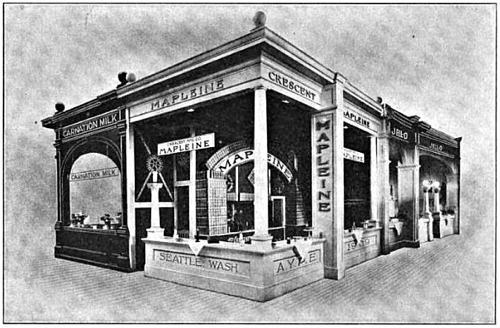 In 1909, Crescent hosted a large Mapleine display at the Alaska-Yukon-Pacific Exposition in Seattle, and described Mapleine, perhaps with a bit of exaggeration, as a “household word” that “spread the fame of Seattle throughout the Western hemisphere.” The booth at the A.Y.P., standing between booths for Carnation Milk (also a local product, at the time, but currently owned by Nestle) and Jell-O, was proudly marked “Seattle, Wash.” in large letters. * Mapleine is still sold today, but Crescent was sold to McCormick and Company, Inc. of Baltimore, Maryland in 1989, and Mapleine no longer promotes Seattle on its packaging. 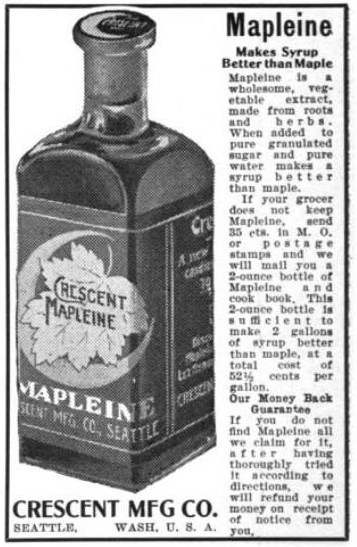 In the next few decades, wartime and depression frugality—along with a lot of advertising and recipe booklets from Crescent—caused Mapleine to grow even more popular. 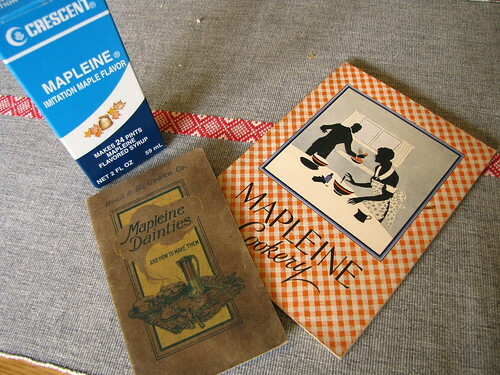 In Part 2 of this series, I’ll post advertising and recipes from Mapleine’s heyday; in Part 3, I’ll make a Mapleine Pie. Crescent's Mapleine display at the Alaska-Yukon-Pacific exposition in Seattle, 1909. *(Editorial note added after this post was published.) On further examination of the picture, it seems possible that the “Seattle, Wash.” lettering on the booth was added to the photo after retouching. However, I cannot be certain of this. The University of Washington has a photo of the same booth, but not only has that area of the booth been clearly retouched in the UW copy, but there are some other small differences that make it seem likely the photos were taken at different times, so the UW photo does not necessarily confirm anything.